It’s the “White Whale” of Joss Wedon‘s Agents of S.H.I.E.L.D. How the hell did Coulson come back after taking Loki’s spear in the chest? 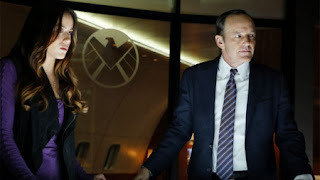 Clark Gregg, Agent Coulson himself, or as I like to call him, Fury Jr., makes some very interesting points and promises about tonight’s mid-season return episode of Agents of S.H.I.E.L.D. TV Guide sat down with Gregg and got the full skinny on what the scoop on the big reveal is: As a fanboy, I thought, How are they going to do this? They’ve been keeping this for 10 episodes. We know that there’s something bogus about the magical place concept. He can’t even say Tahiti without turning into a robot. Is he a robot? How did they bring him back? Is he some kind of Life Model Decoy, as all the Marvel fans think? Is he the Vision? There’s all these theories. How do you do this for real and really pay it off? At the same time, you don’t want them to go, Well, I guess that’s the finale of the show. There’s really no need to continue after this. The bullet was in the chamber, now it’s completely blown. When I read the script, I was blown away because it’s completely satisfying to me as a fanboy, and, as probably the biggest fanboy in Phil Coulson in the Marvel Universe, because it’s not a tease, it’s: here’s what happened! At the same time, what they’ve crafted not only opens up enough questions that are at the existential core of Phil Coulson and his relationship with S.H.I.E.L.D., but really set the direction for the back end of the season and the future of the series. I was very, very impressed with what they delivered here. TV Guide also asked if Coulson’s time in Tahiti would be presented in a series of flashbacks. I wouldn’t call them flashbacks. That doesn’t seem like a term that does them justice. We know that these people (Centipede) are ruthless. We’ve already seen them kill many people. The one thing this Clairvoyant person wants is the one thing they can’t see. The only thing the Clairvoyant doesn’t know is this: there’s a blank spot. They have technology that can reveal those memories, and it’s not a pleasant experience for Coulson. Yet, if he can endure it, there is a possibility that he can get the truth, although to even go down that road endangers all the secrets of S.H.I.E.L.D. How will is all fall out? Is he a LMD (Life Model Decoy), will he become the Vision? Was it just magic? Did Thor take Coulson to Asgard? Was the Cosmic Cube used to revive him? Does S.H.I.E.L.D. even really know what happened to him? What do you think?